The LaserActive (or CLD-A100) is a specialist LaserDisc player designed and manufactured by Pioneer. It was released in Japan and North America 1993. The LaserActive is notable as unlike other LaserDisc players, it can be extended to via additional plug-ins known as "PACs". One such PAC allows the LaserActive to play Sega Mega Drive and Sega Mega-CD games, as well as a brand new software format titled "Mega LD" which makes full use of the LaserDisc technology of the system. Other modules were created to support NEC's TurboGrafx-16/PC Engine console in a similar manner, 3D glasses and karaoke discs. The LaserActive is not a fondly remembered device, partly caused by its high price point, but mostly due to the subsequent failure of the LaserDisc technology as a method of storing video data. Designed as a successor to the ageing VHS standard, LaserDiscs were designed to provide higher quailty video and audio and were less likely to degrade after repeated usage. Unfortunately LaserDisc technology proved too cumbersome to use - each of the abnormally large optical discs could only hold roughly an hour's worth of video, meaning users were forced to repeatedly change discs/sides during the course of an average film. This and the high cost of LaserDisc technology meant the VHS video format continued to dominate the market throughout the 1980s and 1990s, being inevitably replaced with DVDs, which remain in use today. 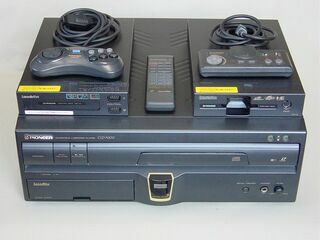 This failure of the LaserDisc technology led to the LaserActive being discontinued in the mid-1990s, however Pioneer continued to manufacture lower-cost players until 2009. 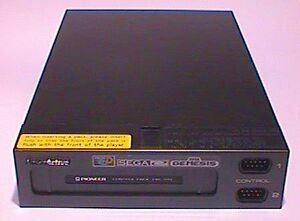 Sega did not manufacture their own brand of Mega LD compatible players, so when the LaserActive was discontinued, the Mega LD format also faded into nonexistence. However, NEC released a cloned version of the system (identified as the NEC PDE-LD1), and both systems support the additional PAC modules interchangeably. Only a few dozen games were made to take use of both the Sega-based Mega LD and the NEC-based LD-ROM² formats, making each game relatively rare and sought-after by collectors. The LaserActive is a relatively large device, mostly to accommodate the large size of physical LaserDiscs. It is also capable of playing CD-ROMs. Both Mega LD and LD-ROM² are encoded in the LD-ROM format, complete with a 540 MB data area (where digital audio would have normally been stored) with sixty minutes of analogue audio and video. Since are no region codes, software from either region can play on any system. Many games are even bilingual with options to choose between Japanese and English. PALCOM LaserDisc games will not play on the LaserActive since they are not compatible with NTSC systems. The plug-in modules listed below are suffixed by (American model number/Japanese model number). Pioneer and Sega released this module that allows users to play 8-inch and 12-inch LaserActive Mega LD discs, in addition to the hundreds of existing Sega Mega Drive and Mega CD titles, and standard CD+G discs. It cost around US$600, and was the most popular add-on bought by LaserActive owners. It comes with a 6-button Mega Drive/Genesis controller that bears a gold Pioneer LaserActive logo. Pioneer and NEC released this module, which allows users to play 8" and 12" LaserActive LD-ROM discs, as well as TurboGrafx-CD/PC Engine CD discs, HuCards and CD+G discs. This PAC is today one of the most sought-after accessories for the LaserActive, and the LaserDisc compatible games are equally rare. The retail price was US$600. The module comes with a PC Engine/TurboGrafx 16 controller pad with a gold Pioneer LaserActive logo. Note: the Japanese version of the PAC is unable to play American HuCard games, and vice-versa. This PAC allows the CLD-A100 to play all NTSC LaserKaraoke titles. The front panel has two microphone inputs with separated volume controls, as well as tone control. The retail price was US$350. This PAC has a 25-pin serial port, allowing the CLD-A100 to be controlled by custom programs authored on PC or Macintosh computers. This PAC came with a 33-button infrared remote control providing more functionality than the 24-button remote included with the CLD-A100. Also included on DOS and Mac floppy disks was the LaserActive Program Editor. The floppy disks included some sample programs created with the editor, for use with the first five LaserDiscs in the Tenchi Muyo! anime series. Used in conjunction with the various 3-D games that were released for the CLD-A100, the design was also compatible with the Sega Master System and could be used with that system, as they both worked in the same way and had identical connectors. Packaged and sold separately from the 3-D Goggles, this adaptor allowed the user to connect the goggles to the CLD-A100, and allowed for up to two users to view 3-D content simultaneously. NEC Retro has more information related to LaserActive.